Mum: Children, mummy is going to shower now. El, please come into the room. I’d be locking up for a while. Jae, please play outside. Kids: Huh? Why? We want to play together! Mum: Play together? Only children who are calm and peaceful are allowed to play together? Those who aren’t need to be separated when I shower. I need to keep you safe. Mum: Really? Ok, you may play together first. If you aren’t calm, then I’ll need to separate you until I’m done showering. Both continue to play peacefully while I keep a close ear on them. This works in the morning when Jae (5y5m) and El (3y5m) are freshly awake and calm. Evening time when they’re more hyper, this probably won’t work. For years, my children and I have been practising some forms of meditation in a science-based non-religious way. Recent scientific studies are confirming the benefits, something that all parents and teachers must know. In short, there are many techniques for meditation and mindfulness is one of them. That is, mindfulness is a subset of meditation. The results in Hölzel et al.’s research (2011) suggest that participation in the eight-week Mindfulness-Based Stress Reduction (MBSR) programme is associated with “changes in gray matter concentration in brain regions involved in learning and memory processes, emotion regulation, self-referential processing, and perspective taking”. This means the person could learn and make better behavioural decisions. Better behaviour?!? As a mum to three super-active boys, this IS just what I need. Mrazek et al. (2013) found out that a 2-week mindfulness-training course “is an effective and efficient technique for improving cognitive function, with wide-reaching consequences”. Two weeks to improve results in a relaxed way? Yes, for us please! In a San Francisco school, after implementing a meditation programme over a four-year period, it was reported that “suspensions decreased by 79 percent and attendance and academic performance noticeably increased”. 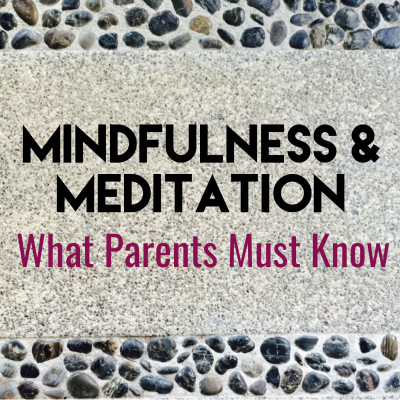 With such a truckload of potential benefits, I’d highly recommend mindfulness and meditation to every parent. relaxation activities before home lessons / tackling homework / potentially-stressful music practice etc. Even when the day turns out challenging, once I remember to implement some of the above techniques, we can recover rather soon. And remember to practise the activities yourself so that you reap the benefits too. As a parent, I’d want to be smart, calm, creative and have enough positive energy to last through a long emotionally-challenging day. Meditation every day certainly helps me to achieve these goals. Hope you found the information useful and happy teaching your child(ren)! Disclosure: Mummy’s Homeschool™ is an information site that receives compensation if readers make purchases from affiliate links (these are marked with an *). If we receive compensation from the companies whose products we review, this would be disclosed. 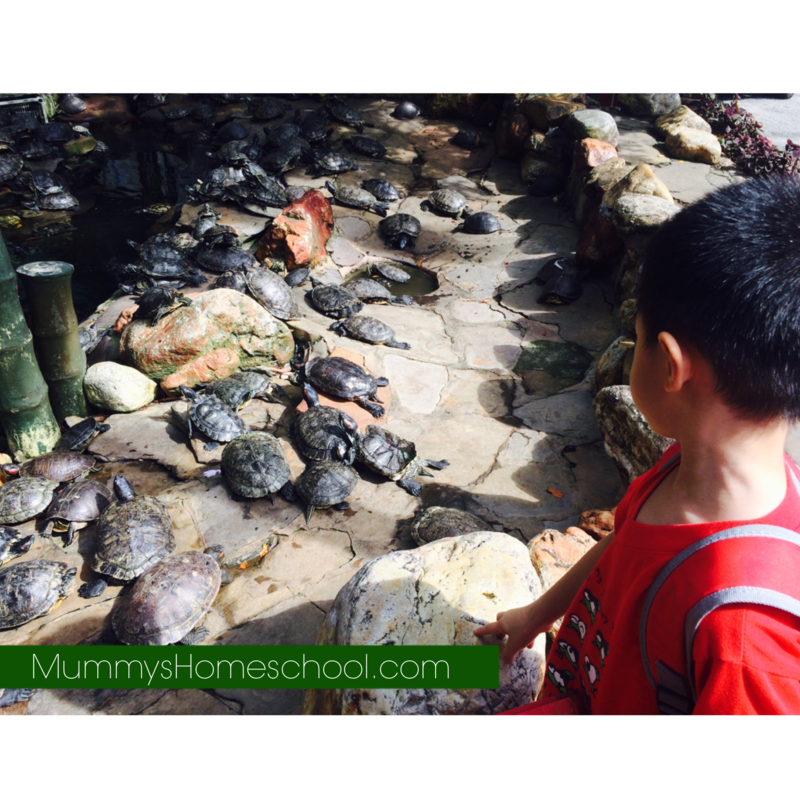 These compensation help to maintain and grow Mummy’s Homeschool™. We are independently owned and the opinions expressed here are our own. 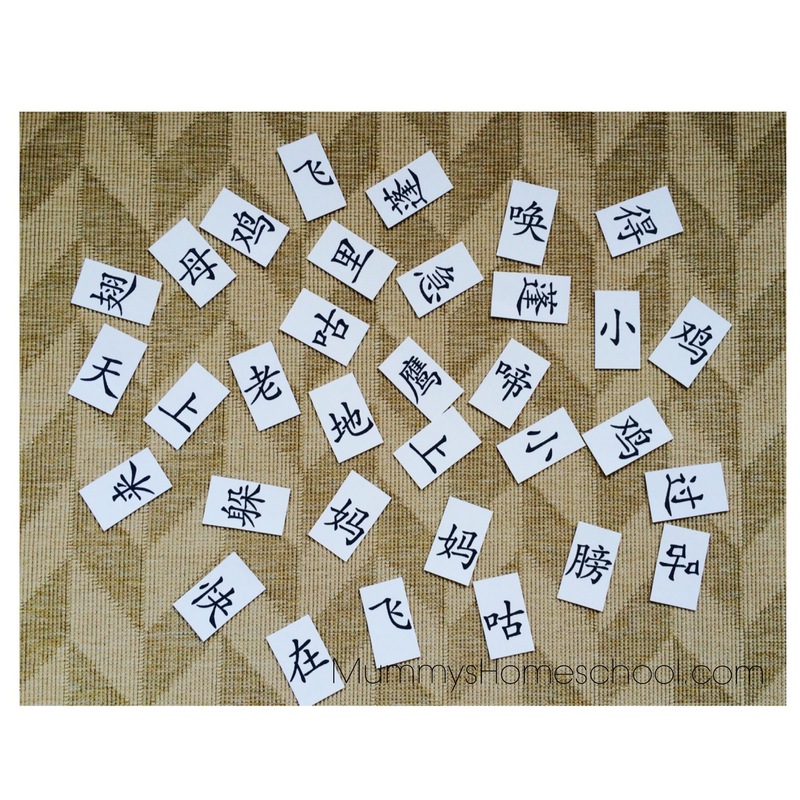 We love playing memory games and Jae (5y3m) just created a new version that may thrill your little one while he’s learning to read. Today, I went for a quick toilet break and asked Jae to arrange the cards. He surprised me by arranging the cards into the picture of a camel. For the next game, he created a picture of a lion (shown above). Such fun! He was happy to play a few rounds, after which he was already familiar with the words and could read them in the booklet. This game would work with word cards of any language. Just print (or write) two sets of the same cards and have fun playing! 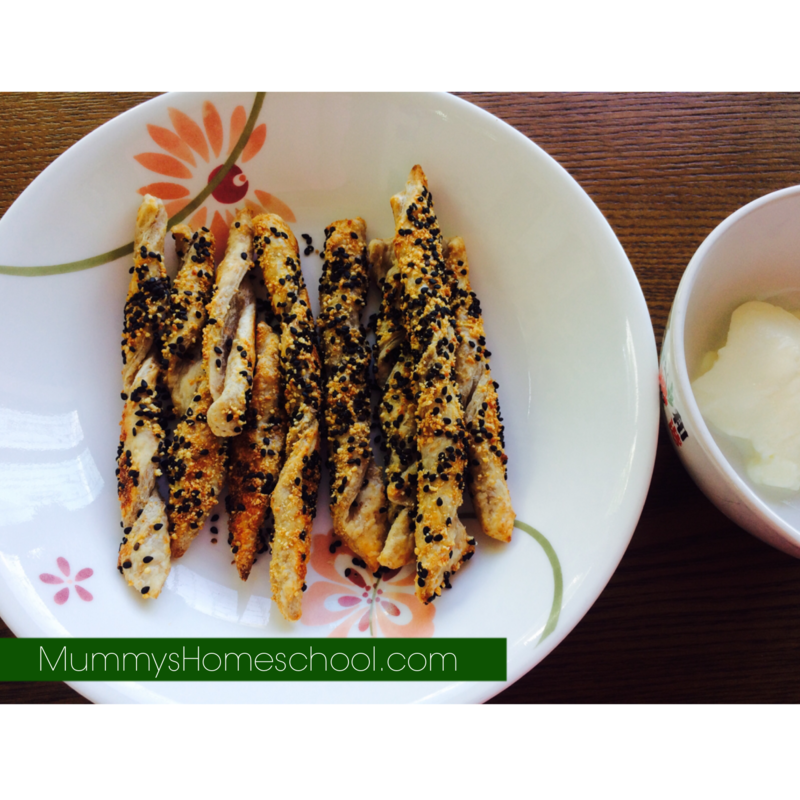 Today, Jae (5y4m) and El (3y3m) helped to prepare their snacks: wholemeal cheese sticks. The recipe is from Right from the Start written by my good friend, Daisy Ng. It happened that I bought too many packs of frozen Kawan parathas by mistake, and have almost all the ingredients on hand, so this recipe was perfect. 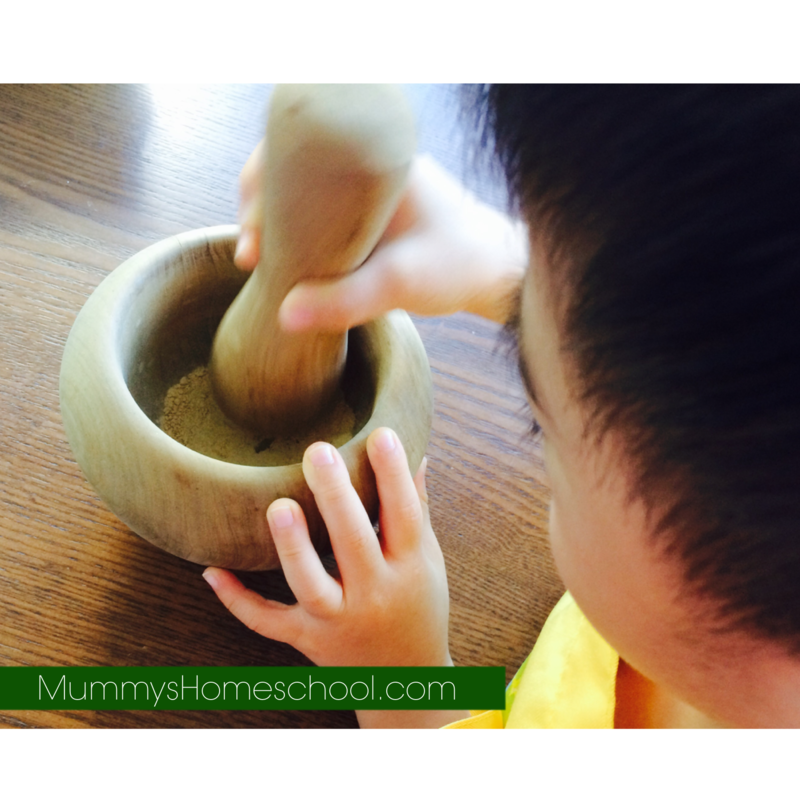 My garlic powder has turned lumpy, so the boys helped to bash it back into powder using the mortar and pestle. They love doing this. They measured the ingredients, mixed them up while I cut and coat edthe parathas. Jae also set the timer on my phone and monitored the count-down. When it was like 50+ seconds left, he figured that 7+ minutes had passed. Great mental math practice! We finally got the cheese sticks brown at about 12 minutes. Paired with a simple yoghurt dip, all the sticks were gone faster than we prepared them! During the second week of Lunar New Year (LNY), I brought 5yo Jae to visit the Thean Hou Temple in Kuala Lumpur (KL) with my friends. 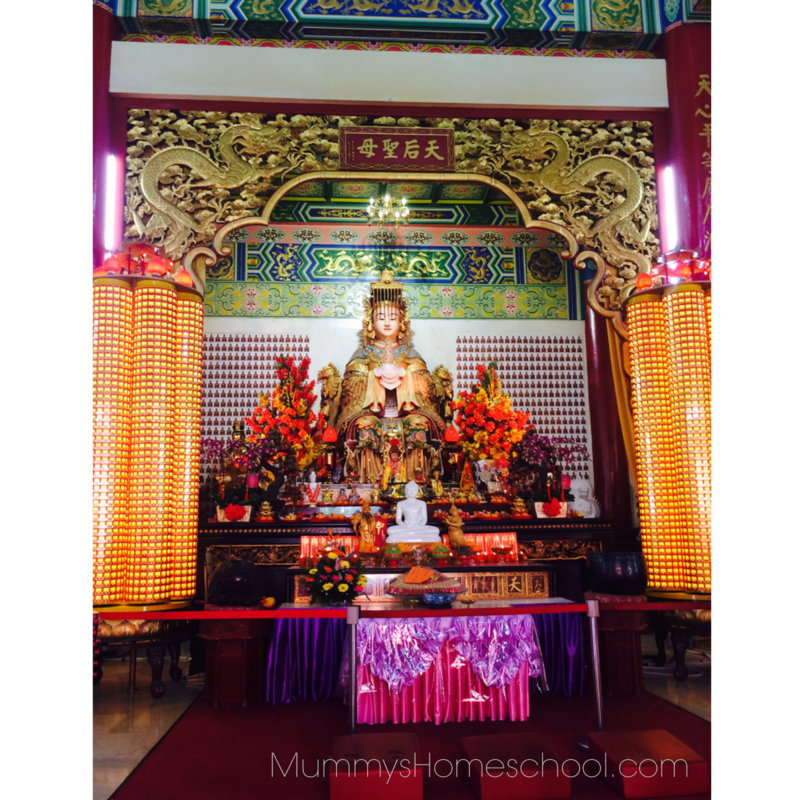 Many Chinese visit Thean Hou Temple during the LNY period to pray for blessings. Though we aren’t a religious family, I took this chance to expose Jae to the local culture. The giant paper-cutting and Chinese chess set are in the collage above. I think Vee will be thrilled to see the chess set. We also saw a pond full of tortoises. Unfortunately, one poor tortoise looked injured. Jae said later that the best highlight of the excursion was drinking Ribena at the food court. Seriously?!? I’m assuming he enjoyed the special time with mummy. For more info, go to Visit KL website. 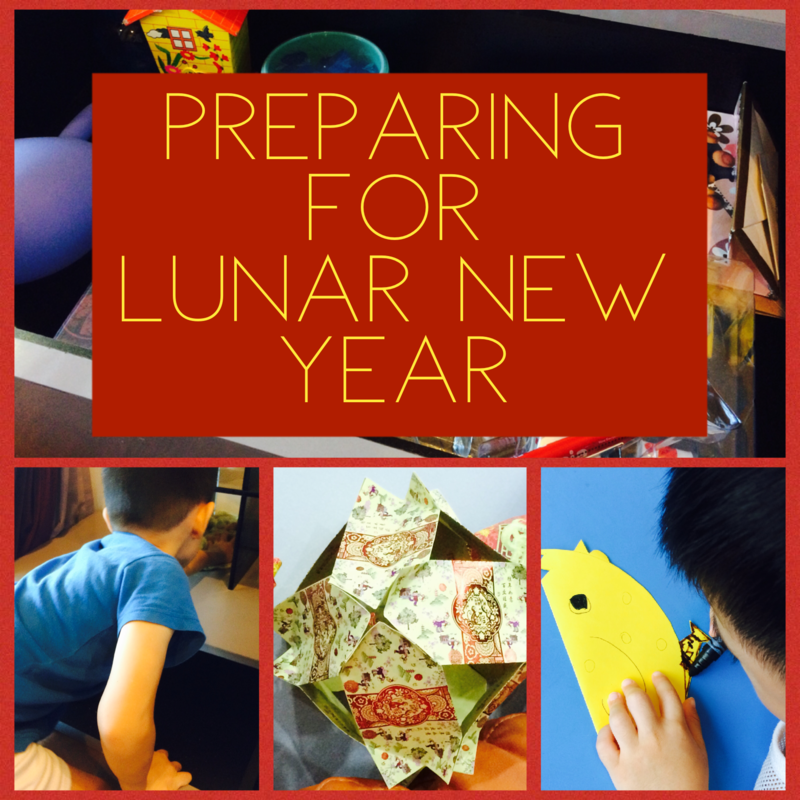 Since Lunar New Year (LNY) is on 28 Jan this year, we find ourselves busy preparing again. The good thing about homeschooling preschool is that I get a longer stretch of time at home by cutting off traveling time. And the young kids get to watch how I get the house ready and learn too. It’s not like they go to school and the house is magically transformed when they’re back. 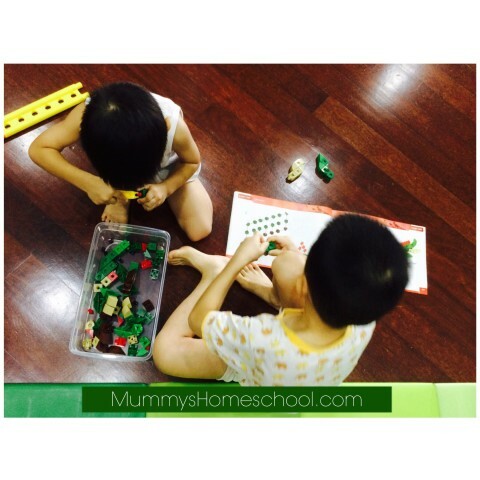 The activities below cover practical life, fine motor skills, math geometry and art. The most important thing for us is to spring clean and clear out the clutter at home. Since LNY is so early this year, I’ve been clearing out old stuff since early December! Today our target is the kids’ “special place”. 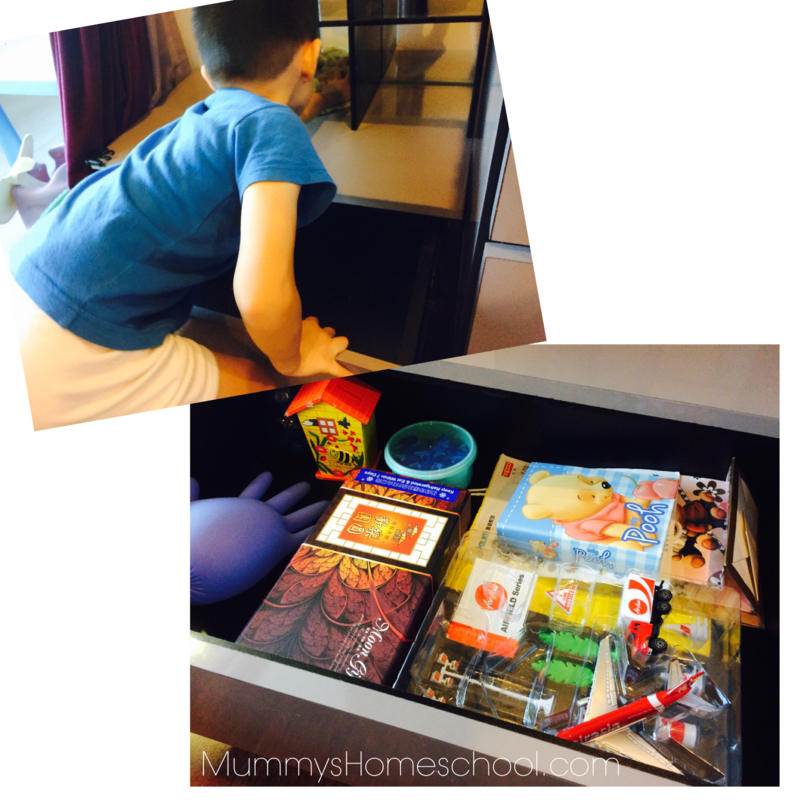 Each child has a personal drawer where he stores his collection of special things, such as piggy bank, photo album, souvenirs, old vouchers, small toys and handicraft. Over the months, the stuff start piling up and the each special place resembles a special rubbish dump instead. Then they wiped the drawer (and neighbouring furniture) thoroughly with a damp cloth, followed by a dry cloth. And ta da… each special place is neat and tidy again. My future daughters-in-law will be thankful to me for all these early training sessions. I found many extra red packets from last year, so we recycled them to make latterns for the first time. It’s easier to do crafts now that our youngest El is more cooperative and independent. 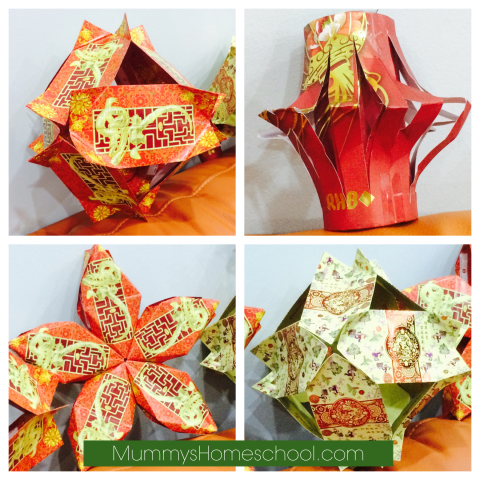 The children (who already love origami) were so eager to make these that they folded and stapled red packets until their fingers were sore. 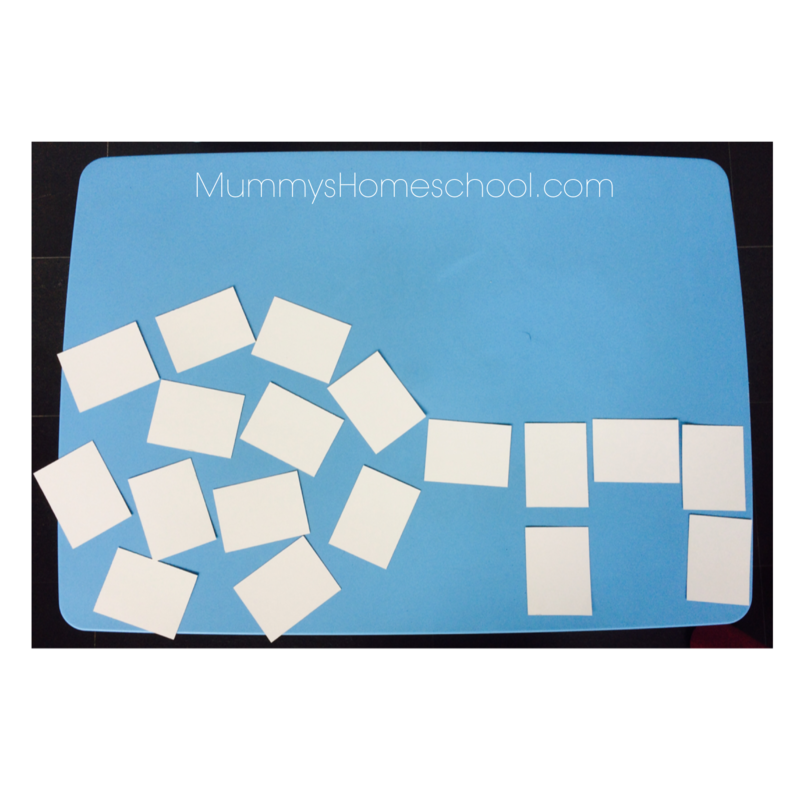 I personally love this activity too because it brings math geometry alive by transforming 2D red packets into a wide variety of gorgeous 3D shapes. For more ideas and tutorials, check out Submerryn’s blog here. Today, we finally removed them and started doing DIY chicken-related craft to decorate the house. Both boys enjoyed colouring their chickens although El’s looked like it fell into mud. Oops! 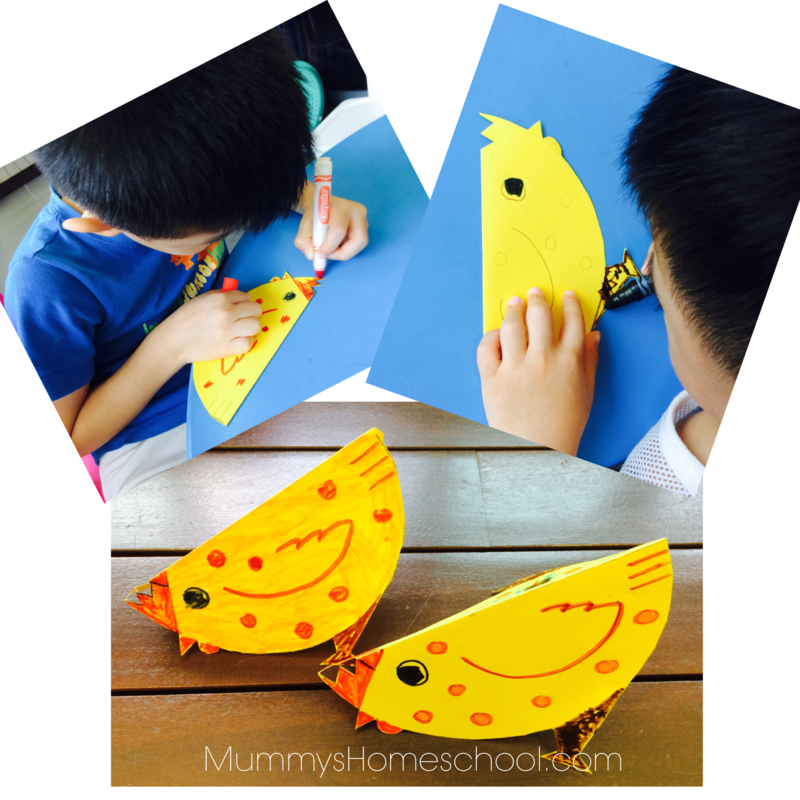 Find more chicken craft ideas at Womenclub.co here. 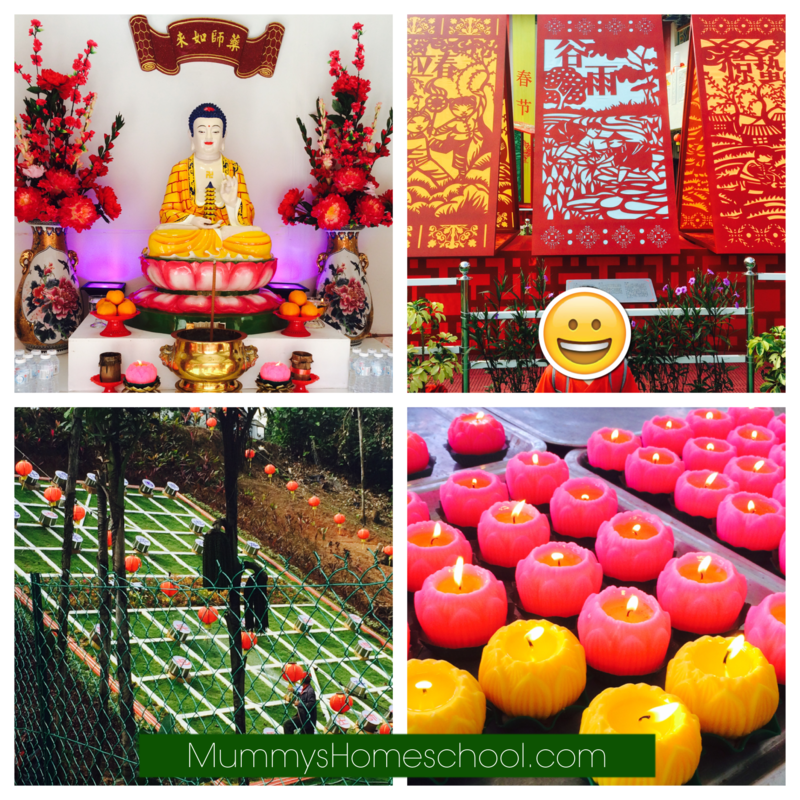 This year, we’d also explore using recycled materials such as used bottles, old magazines, cardboard and (of course) old red packets to create home decorations. This would minimise creation of new garbage. It’s going to be a busy final weekend before LNY arrives. Have a great time! 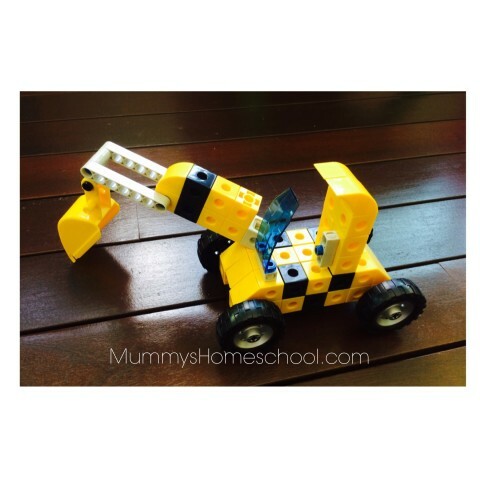 The children have been enjoying their 3 boxes of Junior Engineer toys for several years. 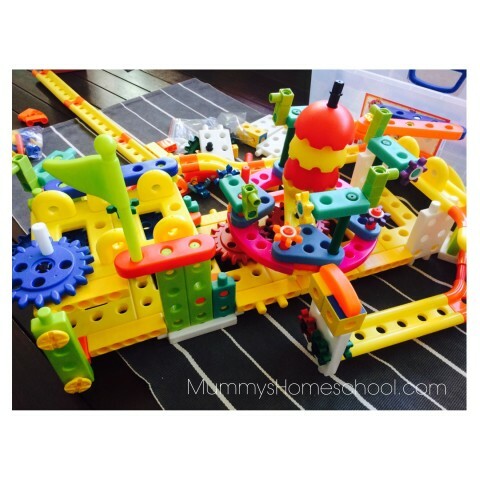 We’ve got Junior Engineer, Mini Zoo (with ball tracks) and Magic Gears. 5y2m Jae is ready to move to construction pieces smaller than LEGO Duplo, but regular LEGO gets too messy with 3y3m El in the house. So that’s where Gigo’s Story Line series caught my attention — neither too big nor too small. We visited Gigo’s Taipei store, wanting to grab the Story Line series. Indeed, the series impressed me — easy-to-hold pieces and patented joints that allow the models to move in various directions. 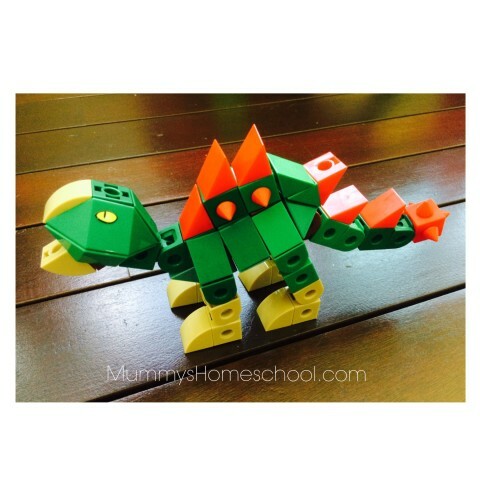 Dino Park: Since the boys love dinosaurs, this set is absolutely suitable. They could build various dinosaurs with movable heads, legs and tails. 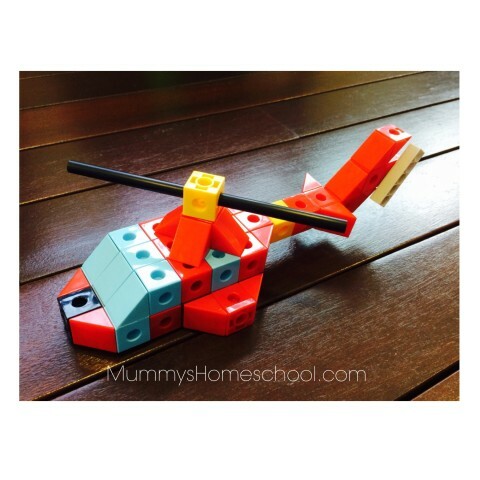 Speed Chaser: This Speed Chaser set lets them build different vehicles. This set is for building at least 10 different heavy vehicles such as the bulldozer, tower crane, cement truck and more. Perfect! Each box set contains about 120 pieces and is priced at TWD649 before discount. After 15% discount, each set was about SGD25 / RM77 / USD17, which we find value-for-money. 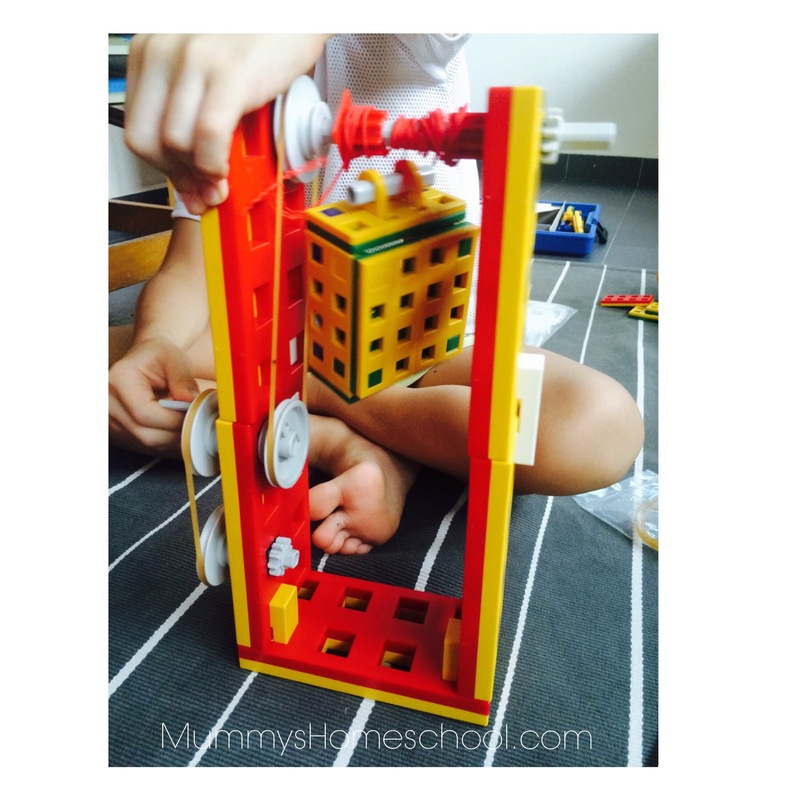 Junior Engineer has been the kids’ staple construction toys for years. Someone would play with it every day, building anything from pretend violin, ladders, ball tracks, animals, buildings to vehicles and more. The large chunky pieces are easy for a toddler to handle. My kids started playing with these from about 18 months old. Then they build progressively more complex models. Even I played with similar toys as a toddler! Almost-8yo Vee seemed to have finally outgrown these until… we saw the huge Theme Park set in Taipei. As a theme park fan, he was attracted by the huge ferris wheel, merry-go-round, and thrill rides the set offers. Daddy-the-ex-engineer is always supportive of developing the kids’ engineering mind and decided to get it. Vee immersed himself in it upon our return until school started, building various complex models (in the booklet) over 3 days. He needed help with looping and tying the rope. Otherwise, we had peace from him for many hours when he literally put his mind and body to constructive use. This alone makes the set a totally worthwhile investment. Peace at home with the 3 boys around is priceless! By the way, the smaller Junior Engineer kits cost about RM220 (SGD71 / USD50) while the Theme Park set cost about TWD4000 (SGD180 / RM565 / USD127). Have fun with your little ones! 7y9m Vee loves robotics. We stopped his school robotics activity after one term because he became too tired to complete his homework and had insufficient time for free play. In replacement, we agreed on joining a robotics programme during the school holidays. So he went for full day session at RM140 (~SGD45 / USD32), paying half out of his savings. In the afternoons, Vee may also work on free coding courses at Code Studio here and learn to use simple computer commands. This is something Vee has little time for during the school term. He spends about 2 hour per session building on his own, trying out both guided and creative building. 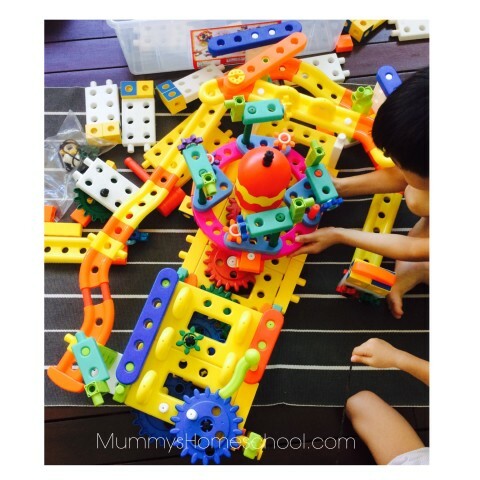 These are superb value for money and offer unlimited possibilities for creative play. 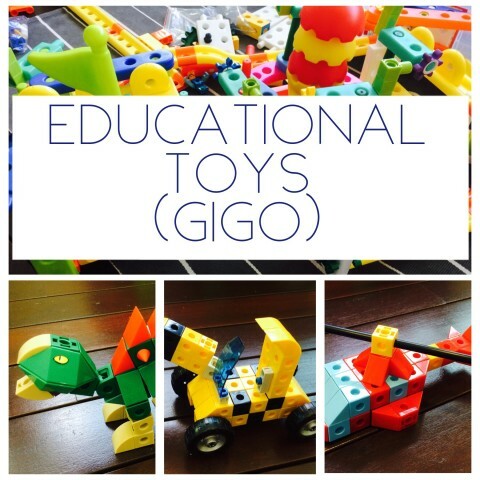 GIGO Junior Engineer* (good for 2+ to about 6 years old): We have 3 boxes — basic set, ball track set and gear set — for the kids’ building projects. Lepao (good for about 5 to 9 years old): Lepao (Taiwan) is the authorised manufacturer of German-designed Lasy blocks, so we bought our huge sets from Taiwan Toy R Us. Learning to cook is an essential life skill. (Frankly, I prefer baking snacks much more than cooking a full meal.) Little El was the first to start on making nutritious cookies — mashing bananas, pouring & stirring ingredients. Older children can help out in more ways in the kitchen, IF they’re cooperative. 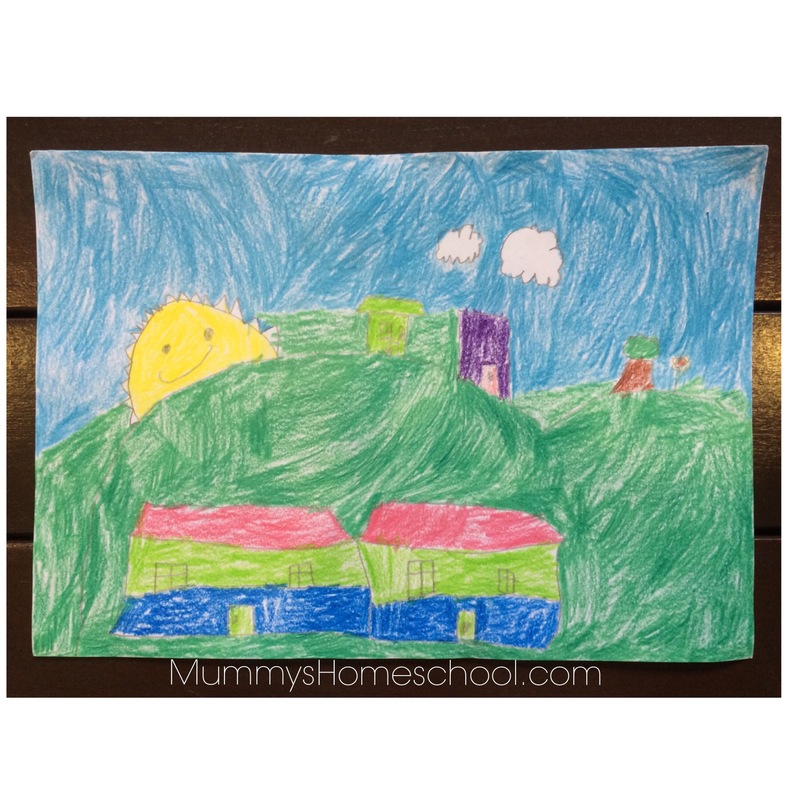 This is something really easy to offer — provide a wide range of art supplies to let the children explore. Give initial guidance on how to use each material and let their creativity run wild — ON the paper, and not on the furniture though. 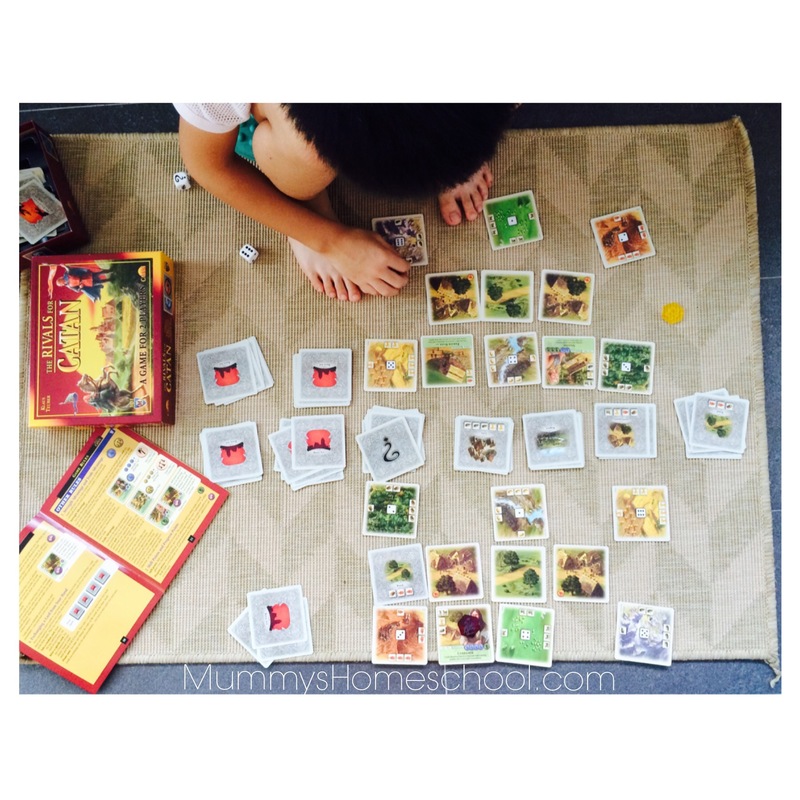 I grew up playing card and board games with my family during each school holidays. Because my dad worked night shifts, the rest of us sometimes played until he returned home at 5a.m.! Currently, Vee is hooked onto playing The Rivals for Catan* with me. We limit it to 45 minutes per session so that I can tend to the younger children too. Embarrassingly, I’ve lost EVERY game so far. He even taught me how he strategised to win. Am I getting old or what?!? Anyway, I’m glad that he’s finding his interests and strengths. It’s been a hectic two-week taking care of the kids from morning till night. 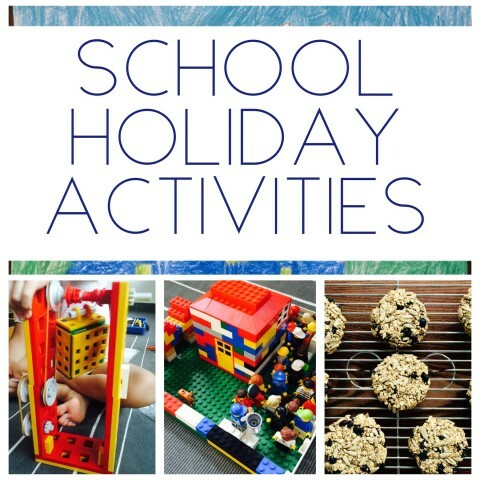 Hope this post gives you some ideas for this or the next school holidays. Have fun! Over the past two weeks, the family has fallen in love with this Chinese nursery rhyme — 老鹰捉小鸡 (translated as “the eagle catches the chick”). It’s catchy, related to a childhood game in my (and probably your) generation and we can’t help singing it. So I created a simple set of flashcards. After singing and flashing it, I hung it on our big pocket chart*. This chart is at our homeschooling area, between the living room and kitchen, with good traffic. Whoever walks past has the chance to read the lyrics. The kids who are learning to write are also attracted to stop and trace the characters with their fingers. Even the daddy was happy to learn the actual words after work. Important: Avoid serif font such as Songti, which adds many small lines and is harder to read. It’s also different from the way we teach children to write. While reading Charlotte Mason’s The Original Home Schooling Series* Volume 1, I came across her ideas on teaching reading and tried new extension activities. Then I showed Jae (5yo) the characters one by one while singing slower than usual. It’s like slow flashing small word cards. And I invited him to arrange the lyrics in the right order. The activity rug should be a short distance away from the pocket chart so that the child has to memorise the character longer while walking back. Yet not too far that the child finds it tiring. As usual, observe your child’s learning needs. Through this activity, he scampered back and forth several times, looking engaged and pleased. After arranging the cards, we sang the song again. 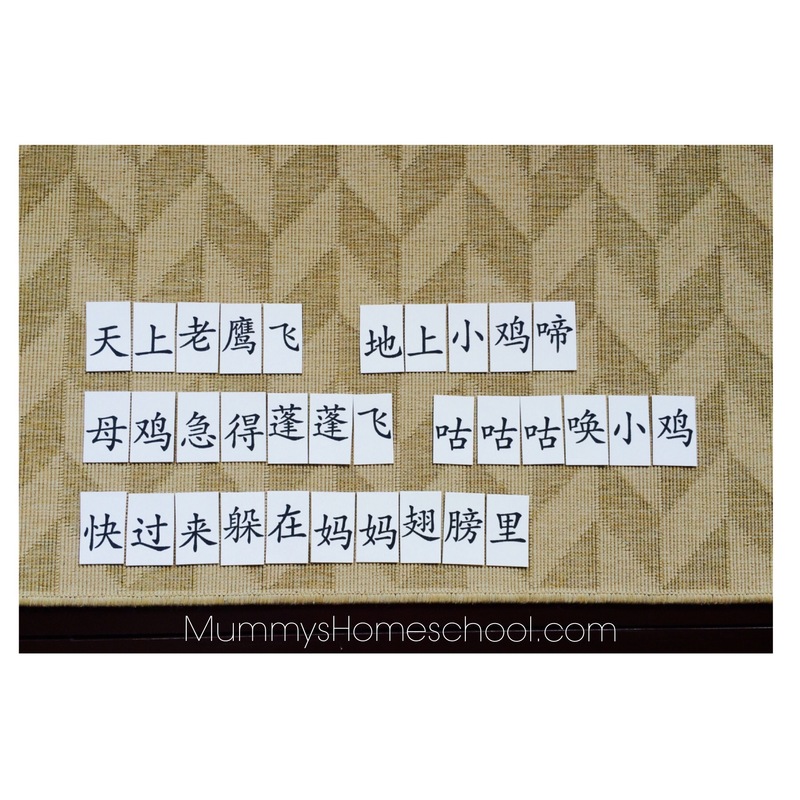 This is an activity he can repeat independently since it has a control of error. Next, I shuffled the word cards and played “Word Search” game with him. He already loves playing memory games with Progressive Phonics game cards, so I knew he’d like this new game. 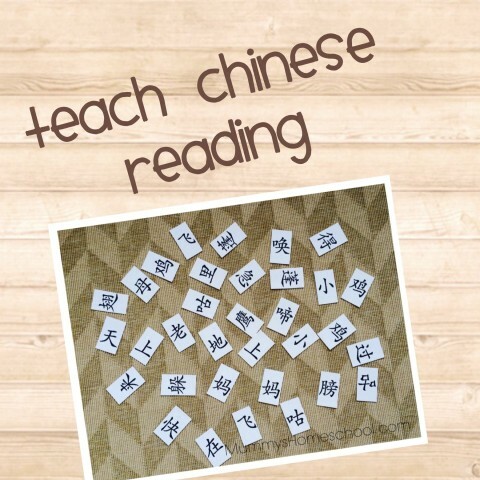 If player doesn’t know the word, he can check out the flashcards on the pocket chart. You can make up your own rules as appropriate. Most importantly, the child gets to look at the characters many times to imprint them better while having fun. Print 1 master copy on cardstock. Print 1 copy (without title) on cardstock. Cut out individual words. Use for sentence building and word search game. 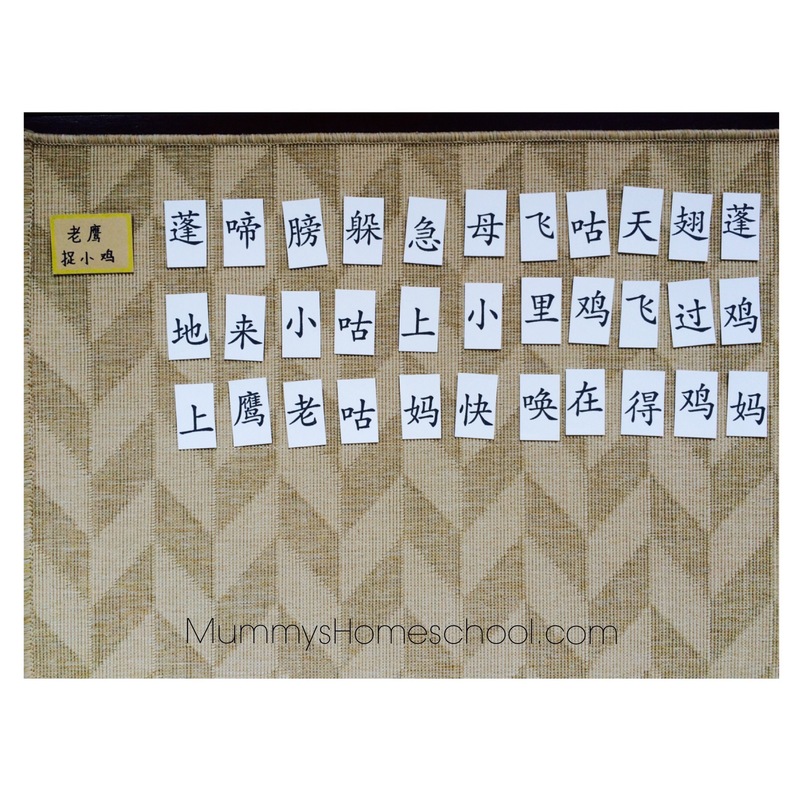 The same ideas above can be used to teach English and other languages too. 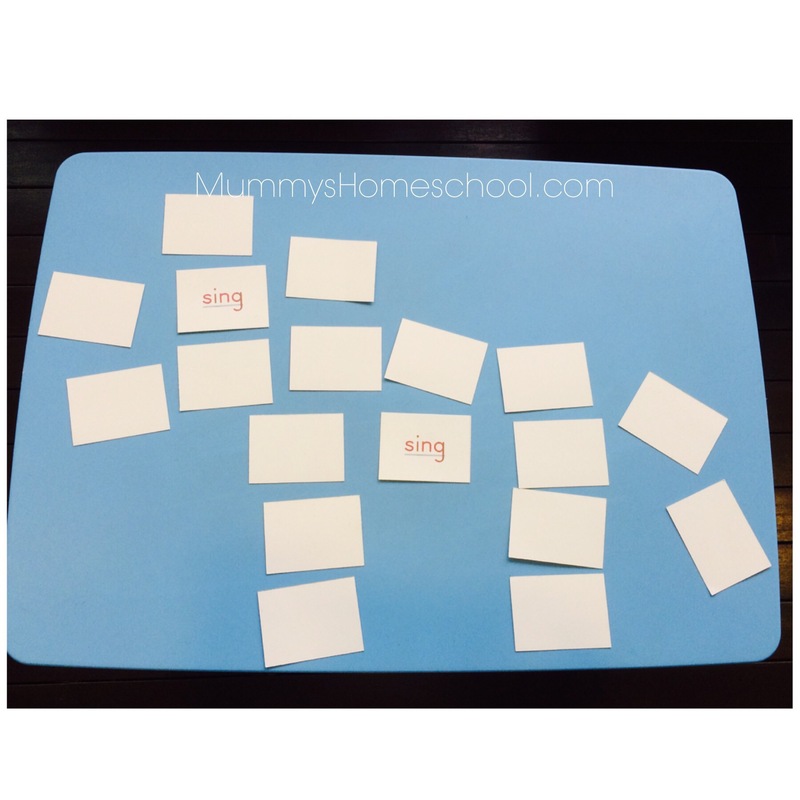 The key is to work from a nursery rhyme or poem that the child loves or would love. Disclosure: Mummy’s Homeschool™ is an information site that receives compensation if readers make purchases from affiliate links (these are marked with an *). If we receive compensation from the companies whose products we review, this would be disclosed. 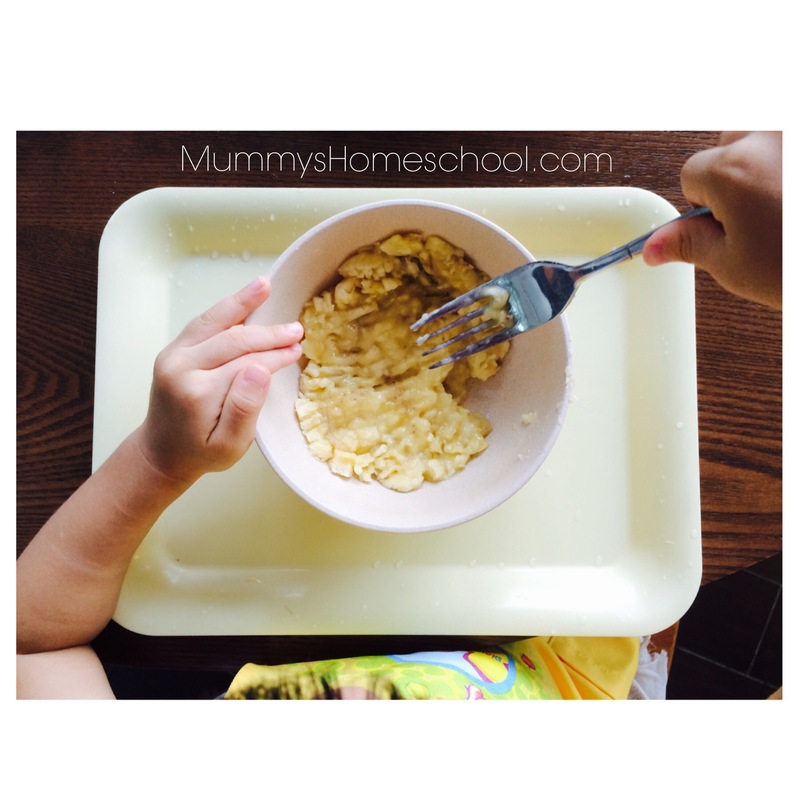 These compensation help to maintain and grow Mummy’s Homeschool™. We test each product thoroughly and give ratings according to our experience with it. We are independently owned and the opinions expressed here are our own. 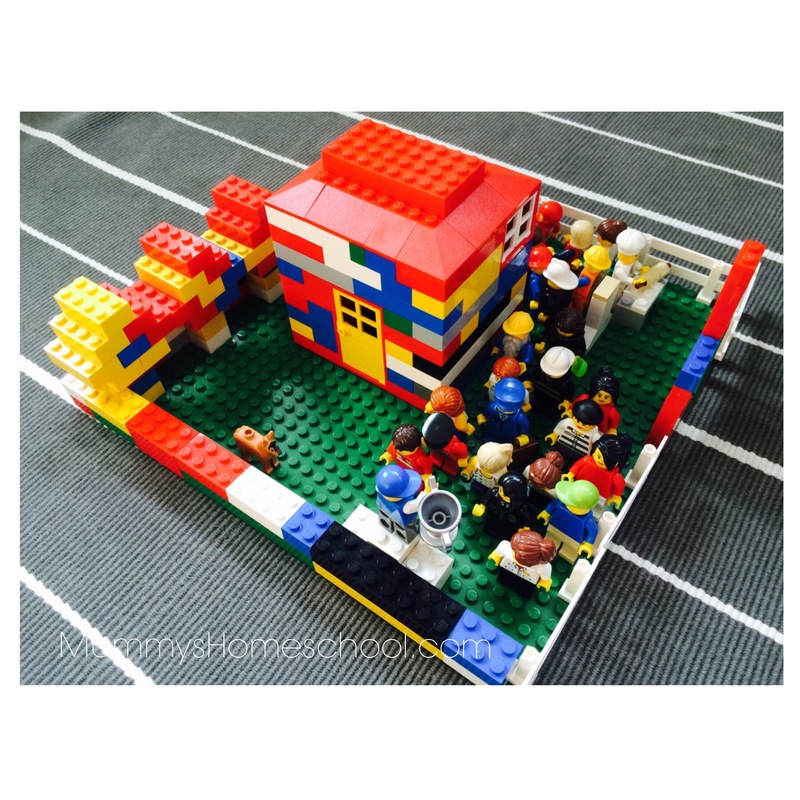 Today’s post is on how I motivated my introverted child to participate in a group performance. My #2 Jae (5yo) is an introvert. In his 4 months in kindergarten, he rarely spoke. 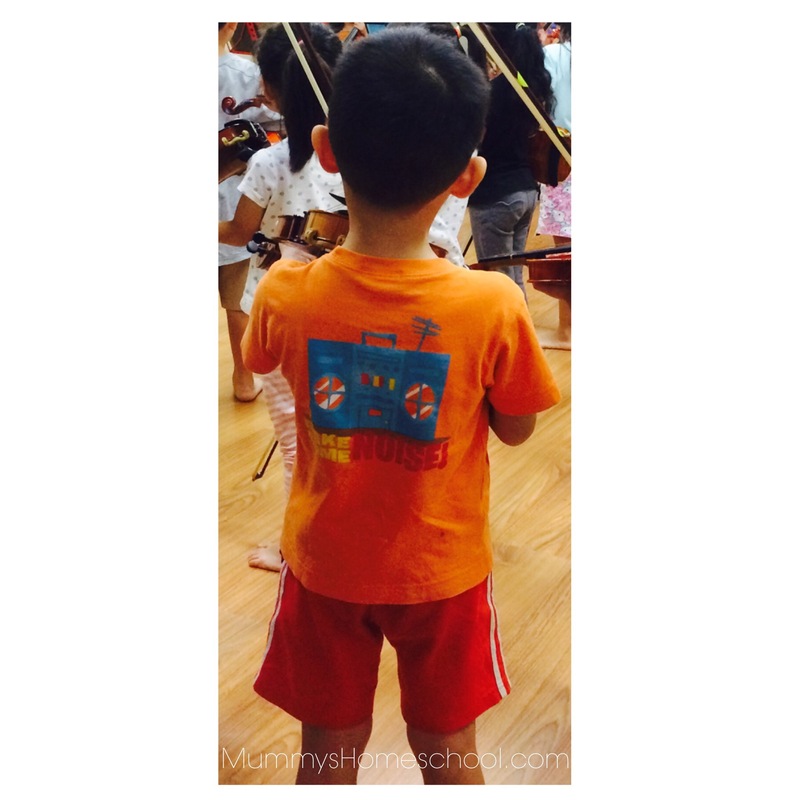 Over 1.5 years of weekly music classes, he rarely interacted with other children. Yet at home, he can be talkative and loud at times. Two months ago, he confidently completed a violin solo event, which means he isn’t shy. Suzuki violin is supposed to be a group class. 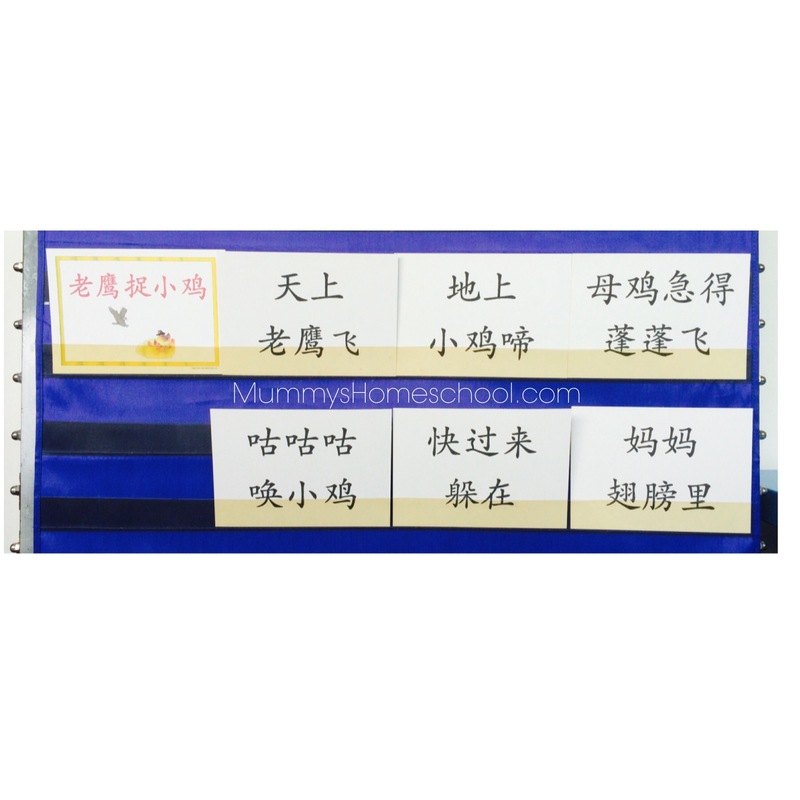 However, his only classmate left some time back, so he has individual lessons. Next month, there will be a Christmas group Suzuki violin performance. During the first rehearsal, he chose to watch without even touching his violin. Among the group of about 30 children are two acquaintances. With about 30 children and 30 adults in the practice studio, nothing near the small company he enjoys, he was expectedly overwhelmed. After that observation session, he was cooperative in practising the pieces at home. Right till lunch time before the second rehearsal, he insisted that he didn’t want to perform. He loves playing the violin, is able to play all the required songs well, and has solo stage confidence. I’d a strong feeling that he simply needed a good nudge to join the new group and I wasn’t convinced to let him worm his way out of the performance. At least not yet. During lunch, I casually mentioned the post-performance celebration, which involves eating at the child’s favourite place. He had the choice of whether to participate, since there was no way to force him onto stage if he refused. His eyes grew rounder, he thought over it for a few seconds and then agreed! I was surprised because just a moment ago, he’d flatly refused to perform. During the car ride to the music school, he napped, so I had to carry him and the violin upstairs. Gosh, hazardous to my back! Thankfully he woke up calmly before participating fully in the session. I didn’t even have to say anything to encourage him in class. The power of the ice cream cone in helping our introvert cross his mental barrier! After the session, he asked if we were going to have ice cream. Ha, of course… not. That’s reserved for post-performance, to celebrate the child’s bravery on stage. I rarely use a external reward to motivate my children. When I do, it’s when there’s no obvious or near-term natural consequence. So this isn’t an overused technique. Each small success will convince the child of his ability, and then I can gradually wean him away from needing any reward. I know my introverted child well. I understand that he needs great courage to try out certain new experiences. I know that he would enjoy the performance and just had to overcome the thought of joining a new and enormous group. A small reward that he loves was all it took to help him focus on the longer term and bear with the initial discomfort. Disclosure: Mummy’s Homeschool™ is an informational site that receives compensation if readers make purchases from affiliate links (these are marked with an *). If we receive compensation from the companies whose products we review, this would be disclosed. 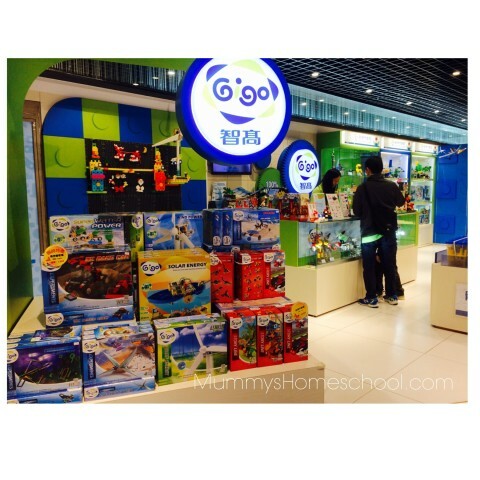 These compensation help to maintain and grow Mummy’s Homeschool™. We are independently owned and the opinions expressed here are our own.